TABEDE focuses on the development on the building side, with the aim of delivering a set of TRL-6 technologies to allow all buildings to become demand-response ready without needing high investment cost. TABEDE targets existing and new building management systems (BMS), the micro-processor based networks for monitoring and control of building mechanical and electrical equipment and services such as air conditioning, ventilation and security systems. TABEDE will act as a BMS extender to enable DR features between the grid and the BMS, as well as other appliances not connected to the existing BMS. It aims at providing, thanks to a “BMS add-on”, a bridge to the smart grid—independent from the building’s BMS brand. TABEDE will also allow the integration and the control of new elements to the BMS. TABEDE will ensure the communication with the grid. 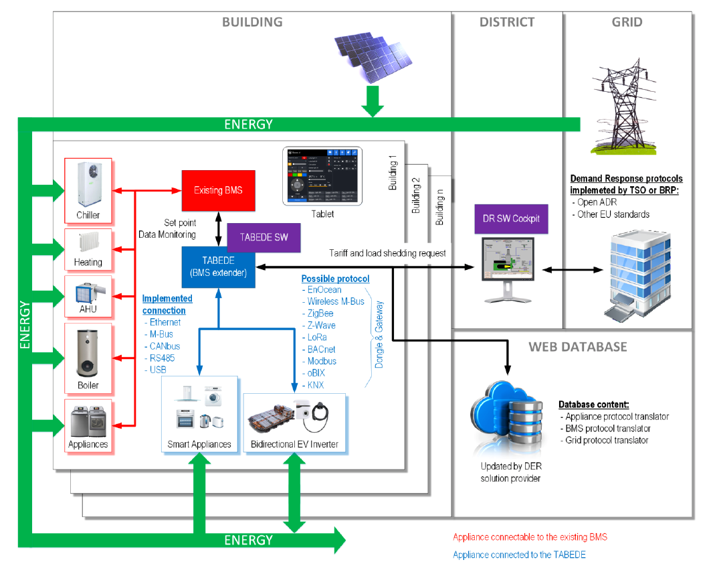 It will provide an advanced control system, which will establish the best DR strategy to operate the connected electrical loads based on the profile received from the grid and the prediction of the renewables production (if needed and available) while respecting the occupant’s comfort and the appliances’ use constraints. TABEDE will be physically placed near the BMS. TABEDE will communicate with both the BMS and the grid, directly or via a DR software cockpit. An open, semantics-based web database providing translation utilities for protocols used on demand response grids will be implemented. Whenever needed, TABEDE will communicate with the web database to get plugins or updates for the newly installed equipment. direct control of the new installed equipment which will be directly connected to the TABEDE bridge, such as lighting, smart plugs and EV charger.